In Spain, landcapes are historically hit by erosion according to an influential study by the Pirenaic Institute of Ecology. 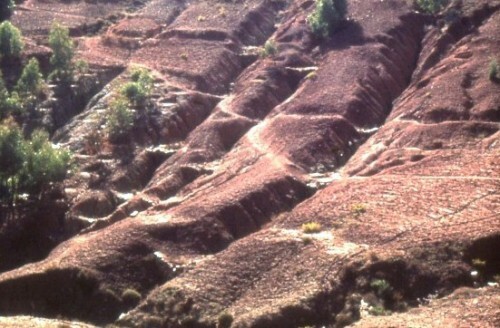 Soil erosion is a common issue in the Mediterranean environment. Human settlements (both households and industrial/agricultural facilities) affect, in the long term, the local nature’s balance, by force changing the original mix in favor of a man-compatible scenario. In Spain, landscapes are historically hit by erosion. According to an influential study by the Pirenaic Institute of Ecology, the expansion of cereal agriculture and transhumant livestock between 1500 and 1800 lead to broad soil erosion. In 1900, mountainous areas lost much of the traditional farmland capacity. The consequence was a reduction in soil erosion since re-vegetation literally gained ground, even though in the upcoming decades the increasing dynamism of national and international trade brought to extensive farming (olives, almonds, vineyards) on unstable terrains, often resulting in a less careful soil conservation practice. It is surely interesting to compare the above mentioned study’s chart with today’s open data in order to assess whether soil erosion is still of public concern among Spanish web surfers. Soil erosion issues are clearly concentrated in Southern Spain (Andalucia, Valencia, Catalonia), the Pirenaic region and Galicia in the North. Surely, there is a clear correlation between the two charts, suggesting that erosion issues are still today of great interest among Spanish web users. With the help of modern technologies and Open Data analysis, Maccaferri engages through listening local communities and providing high-value advice and erosion control solutions, thus securing infrastructures, agriculture and the local economies. If you wish to know more about our erosion control solutions, please contact us.